In our Pyramid patio heater review we will do a review of the AZ Quartz glass tube patio heater in Hammer Bronze and Mocha Bronze. 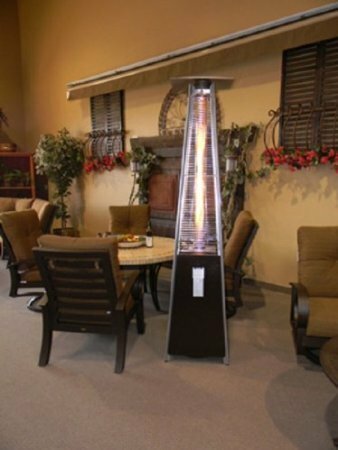 The Az patio heaters are very well known and CSA approved. This means that it is tested an approved for the US market. For consumers, the mark provides increased assurance of quality and safety. 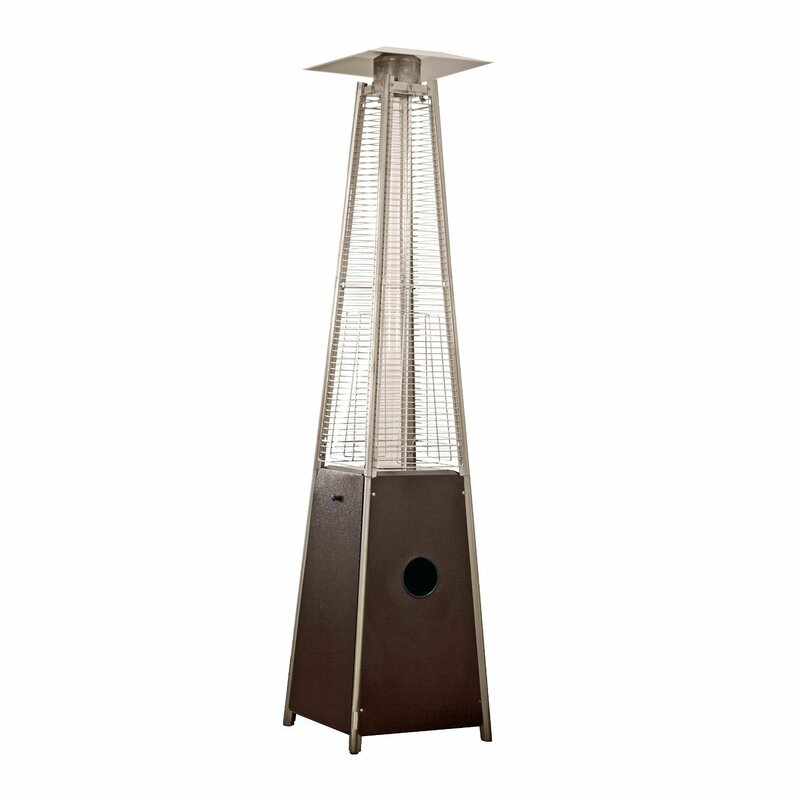 The installation manual that comes with it tells us to place it at least 24 inches away from the wall and 36 inches clear space above this pyramid patio heater. There is some assembly required but when I looked at the manual it seems to me that it comes with pretty clear instructions and there are many pictures included. In the reviews I read however it shows that assembly it not to clear explained in the manual. The measurements says 38.5 x 21 x 21.5. The real height is 89 inches. Weight of his heater is 68.2 pounds without the propane tank installed. Q: What is the heating radius? We always look at the low ratings to begin and try to find similarities in them. The lower rating complained about the poor quality of the manual when it comes to assembly. But in my opinion it has to do with how handy you are, because many others wrote that it was not hard to assemble. A few lower ratings because the product was damaged while transported. Not the fault of the product, but of the delivery company. I can understand that it is annoying, but should not affect the rating of the product. Some complaints about not giving of enough heat. Check the regulator first to see if the safety kicked in. Reset and try again. Heat distribution depends on where the unit is placed of course. Out on the patio it will not give as much heat as in a screened in porch. The looks and appearance got only great comments. The unit looks great in any situation and will be a eye catcher. The packaging got some bad reviews and this might cause the product to be damaged. Send it back right away. Unfortunately this patio heater is made in China and although made by the AZ standards it might mean that the complaints about the packaging can come from there. 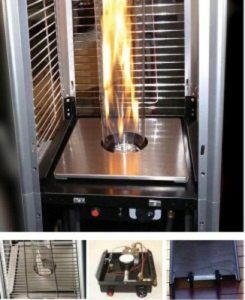 The heat distribution also got some mixed opinions and some mentioned the flame not being to high. This can be caused by the safety feature of the regulator. This kicks in if the gas flow is to high. Recommended is to turn of the gas at the tank and let is sit for a minute or two. Than turn is back on real slow to give the regulator time to build up pressure and not turn in to safety mode again. After this the unit can be light and should work good. Heat distribution also depends on where the unit is placed of course. On an open patio in cold conditions it will not work as well as on a covered porch on a cools summer evening. Moving the unit was also divided in 2 camps. There were more people who mentioned that it was easy to move with the propane tank in the unit but some others mentioned that the wheels are not made for the total weight of the unit including the propane tank. We have to hold of on giving our opinion about this since it is not clear. We will try to do some more investigating for this and add it later to this review.